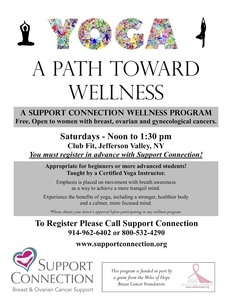 Support Connection, Inc. announces a free program: “Yoga: A Path Toward Wellness” will be offered from 12-1:30 pm, at Club Fit in Jefferson Valley, NY, on the following Saturdays in February: 2/9, 2/16, 2/23. Open to women living with breast, ovarian and gynecological cancers. To learn more or to pre-register (PRE-REGISTRATION IS REQUIRED) call Support Connection at 914-962-6402 or 800-532-4290. INSTRUCTOR: Mia Azcue, CYT, E-RYT 500, RPT. Mia has been a yoga student and teacher for 20 years, and is a longtime instructor for Support Connection. She is certified by the American Viniyoga Institute as a yoga teacher and a yoga therapist. She is also NYS licensed Physical Therapist. Mia’s training enables her to assist each person with any physical, emotional and/or spiritual challenges she may be facing. SUPPORT CONNECTION, INC. is a 501 (C) (3) not-for-profit organization that provides free, confidential support services and programs to people affected by breast and ovarian cancer. Founded in 1996, Support Connection is based in Yorktown Heights, N.Y., but through our toll-free hotline and website we serve people throughout the country. Services include: One-on-one peer counseling and support groups, offering women the opportunity to connect with other cancer survivors; Ongoing wellness classes; Holistic health workshops; Public educational programs; Information and referral services; A toll-free cancer information and support hotline (1-800-532-4290.) To learn more, visit www.supportconnection.org or call (914) 962-6402. Support Connection Breast and Ovarian Cancer Support: We’ve been there. We care.